March 2008 appearance on "Positively TEXAS! ", CBS11. Iola Johnson, host. (Part 1 of 2) KERA Dallas 13 - PBS Think, Feb. 22, 2008 (Hosted by Krys Boyd) What can we all learn about tenacity and joy from children, even when they're unable to communicate verbally? 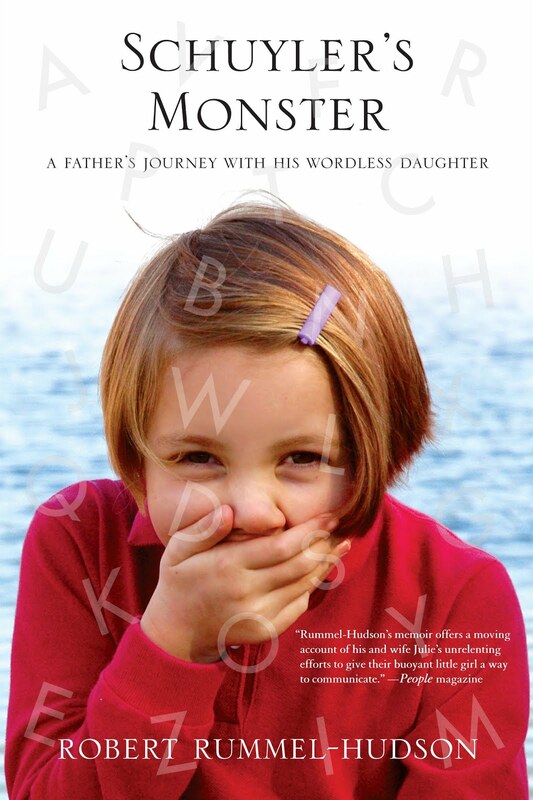 Robert Rummel-Hudson, whose daughter was diagnosed at age 3 with polymicrogyria, a rare disorder that leaves her unable to speak, will join us this evening to discuss his family's triumphs in the face of an extraordinary challenge. His book is Schuyler's Monster: A Father's Journey with His Wordless Daughter (St. Martin's Press, 2008). A peek at how Schuyler communicates in the course of a typical evening. When we were trying to convince Schuyler's old school district to incorporate her speech device into her curriculum, we made a movie of her first efforts to use it. She'd only had the device for about two weeks at this point. Schuyler got her new speech device, a Vantage Lite from Prentke Romich. This video doesn't really show her using it very much, other than just playing with it, but I wanted everyone to see how happy she was when she got it. Also, a little bonus goofing around at the end. A glimpse into the daily life of Schuyler, in which she uses her Prentke Romich AAC speech device to order dinner and make observations about the world around her. Schuyler tells a short version of the story of the movie Coraline. In the past, I've posted video of Schuyler in which a lot of people said "Oh, I can understand her just fine!" The reality of Schuyler's speech, however, is that removed from predictable context, it becomes much more challenging. I will say that in this video, I can understand more than I can't, and I'm sure Julie would be able to as well. But this will give you a more accurate picture of how she speaks. And how much fun she is, too. I thought this would be a good way for people to see how well Schuyler is reading now, as well as providing another example of her verbal speech (with the actual words she's reading for comparison). I'm proud of her because this was a new story that she was just given in her summer school class earlier that day. As far as I could tell, she'd only read through it once before.